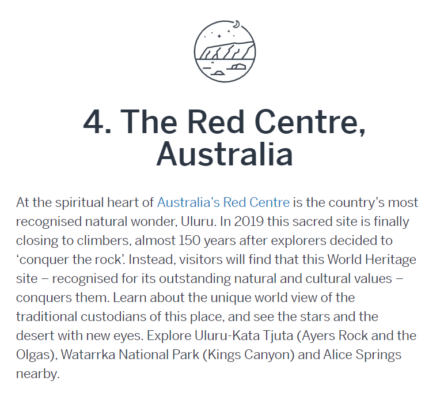 Australia's 'Red Centre' has made Lonely Planet's top five in their list of regions that are ready for the spotlight. We strongly agree with Lonely Planet that our Red Centre is one of the most spectacular regions in the world to explore, and we think the best way to explore this region is on a bike! So much so, that we've designed an eight day premium cycling tour through Central Australia – taking in all the sites, with some extra special comforts along the way. The Great Outback Escape is no ordinary cycling tour. It’s an eight-day, bike riding holiday offering unforgettable experiences both on and off the bike. During the day, riders tick off bucket list items such as the infamous West MacDonnell Ranges and Kings Canyon, as well as the iconic Uluru-Kata Tjuta National Park by bike. At night, it's all about resting, relaxing, refueling and refreshing in three to five star accommodations. There is also a range of special activities on offer each day that make this a once in a lifetime experience. Check out our day by day breakdown for more information. Bookings are still open to join our maiden journey through Central Australia. If this sounds like an opportunity you simply can't miss, click the "enquire now" button below to get in touch with the team!